How else do you grow an economy by 80 percent without increasing carbon emissions? Earlier this year, California raked in $2.7 trillion gross state product, overtaking the UK as the world’s fifth largest economy — only Germany, Japan, China and the US itself produce more annually. It isn’t just our lush farming regions or the technological wonders coming out of Silicon Valley that have made California an economic bellwether, the state’s strict adherence to environmental regulations, which go far and above what the rest of the nation demands, have certainly helped as well. California has long been on the leading edge of environmental regulation. The state created its first Air Pollution District way back in 1947, a decade and a half before the passage of the US Clean Air Act, in response to public outcry over the air quality in Los Angeles. The benefits of these environmental regulations are well-documented. For the past 25 years, the state’s GDP and population have steadily increased while per capita carbon dioxide emission rates have remained static. Since 2006, when the state passed its California Global Warming Solutions Act, per capita GDP has increased by $5,000 (nearly double the national average) and job growth has outpaced the rest of the nation by 27 percent while its per capita CO2 emissions dropped 12 percent, according to the annual California Green Innovation Index from California-based think tank, Next10. And it’s not just the air we breath but also the structures we live and work in, that have also benefited from environmental regulation. While the state has only just recently proposed requiring new homes to come equipped with solar panels, California has been dictating environmentally-conscientious building codes for decades. In 1978, California implemented a series of radical and far-reaching changes to its residential building codes that would gradually become more strict over time. The aim was “to reduce the electricity and gas now used in typical new buildings by at least 80 percent for new buildings constructed after 1990,” per the California Energy Commission’s 1979 biennial report. Compared to pre-code houses, the modern California home uses 75 percent less power. Taken together, statewide household energy savings since 1978 run equivalent to the output of seven 500 MW gas-fired plants. Overall, the state’s per capita energy use has remained flat since the 1970s despite its economy growing a whopping 80 percent over the same period. Even during the bad times after the 2008 recession hit, California lawmakers ignored calls to gut the protections in the name of economic growth and instead established the state’s greenhouse gas emissions cap-and-trade program — the only one of its kind in the nation — which in 2016 cleared $2.5 billion in revenue from emission permits. Today, green sector jobs outnumber those in the fossil fuel industry 8.5 to one. California has 300,000 jobs in green energy, more than double the 146,000 offered in Texas, the next largest employer in that industry. 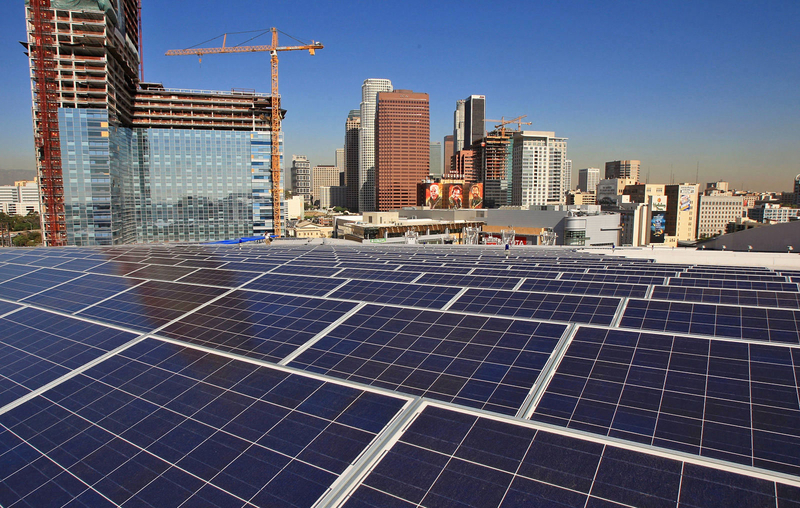 However, California’s aggressive carbon cutting programs could soon face an economic backlash. Last year, Stanford University energy economist Danny Cullenward released a study arguing that, should California continue to tighten carbon emission restrictions, it could price fossil fuel companies out of the state through exhorbitant operational costs. This, he asserts, could cause gas prices to skyrocket and potentially cause the environmental programs to lose public and political support. While the state looks to be on track to hit its 2020 carbon reduction goals, to actually hit the recently enacted 40 percent additional cut by 2030 could force California lawmakers into a legislative corner. Luckily, there are already a number of potential solutions being discussed in the Capitol should that happen — everything from accelerating the development and deployment of renewable energy infrastructure to extending the cap-and-trade program to allowing regional power grids to share renewably produced energy across state lines. That decision will not likely involve any input from the federal government as many of these regulations run counter to the public positions of both Scott Pruitt’s EPA and the Trump administration. In fact, in February of last year, Senate President Pro Tem Kevin de León raspberried the administration when he announced legislation that would ensure existing federal rules on air quality, water protection, endangered species and worker safety enacted prior to the start of the Trump administration would remain enforceable within the state, regardless of whether they were rolled back nationally. “California can’t afford to go back to the days of unregulated pollution,” De León told an assembly of reporters during a press conference. “We’re not going to let this administration or any other undermine our progress.” The California legislature attempted a similar gamble back in 2003, during the George W Bush administration, when it sought to maintain existing standards for power plants while the Feds were relaxing regulations. Then again in March of 2017, the California Air Resources Board voted to increase the fuel efficiency standards of gas and hybrid-electric vehicles in the state, just as the EPA was touting a nationwide rollback of those same regulations. Established in 2012, the fuel efficiency rules demand that vehicles hit 54.5 MPG by 2025. The Trump administration has tried to lower that standard. “All of the evidence — call it science, call it economics — shows that if anything, these standards should be even more aggressive,” board member Daniel Sperling told the New York Times. What’s more, this past April, California Attorney General Xavier Becerra announced that is office is bringing suit against the EPA over its reportedly illegal rollback of the “Once In, Always In” policy. This policy required the state’s leading producers of air pollution, those that produce more than 10 tons of a single pollutant or 25 tons of mixed emissions (think, oil refineries), to take permanent steps to reduce their emissions.